Once upon a time, you could draw a map of the known Internet. 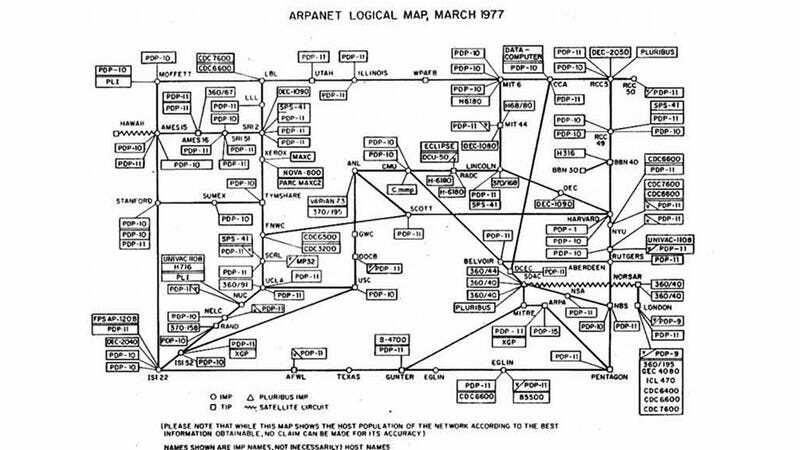 Here's what the world of networked computers looked like in 1977 when ARPANET was still just a huge government-funded science project. It's actually incredible that the network proliferated this much in the eight years after the first four-node network was established back in 1969. The map shows the different locations of the connected computers, which at this point were all owned by universities (Stanford, UCLA, et al) or the government (ahem, the Pentagon). The make and model of the computers at each of the locations are in boxes. For example, PDP 11 describes the Digital Equipment Corporation's Programmed Data Processor 11. This ARPA program has created no less than a revolution in computer technology and has been one of the most successful projects ever undertaken by ARPA. The full impact of the technical changes set in motion by this project may not be understood for many years.